though his sounds are completely modern, synthesized and rendered with crystal clear production, he continues to tend the deep roots of lost wisdom and mythology that have sustained human creativity for millenia. The name of his personal label Outis, for example, is taken from none other than Homer's Odyssey (OYTIΣ, literally meaning "no one," was the pseudonym that Odysseus used to succeed in his infamous deception of the cyclops Polyphemus). This choice of name is not just a clever title for Sabatini's label, but is a very good indicator of his own character: working within the anonymous electric wilderness of techno, Sabatini continually goes beyond expectations by bringing the senses back into this world of automation and machines,, occasionally invoking the names of the old gods (Poseidon) or goddesses / muses (Mnemosyne) along the way. Along with the work released on the Outis label, Sabatini has been a reliable fixture on labels like Stroboscopic Artefacts, Elettronica Romana (home to several releases by his 'Modern Heads' duo with Gianluca Meloni), Adam X's Sonic Groove, and Prologue. Listeners familiar with these labels' respective approaches will understand the kind of versatility it takes to record for each one without sacrificing one's 'trademark' sound in the process. 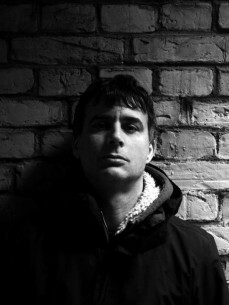 In just the past few years, Sabatini has issued sonic statements characterized by sensations of pulsating darkness (2011's Small steps EP on Sonic Groove), by intense and penetrating hypnotic effects (both the critically acclaimed Daughters of Phorcys EPs on Prologue, 2010), and of course by the cinematic full-length adventure Shaman's Path (also on Prologue, 2012). The latter, a fully developed concept album dedicated to those musically gifted guides who take us beyond objective reality into more mysterious realms, is as diverse in its sonic details as the rainforest is in biological forms, weaving a many-colored tapestry of sound around its patient, insistent trance rhythms. Not content with even this high level of inspired eclecticism, Sabatini's new Omonimo LP shows he is capable of sublime romance, featuring graceful collaborations with jazz pianist Antonello Salis.